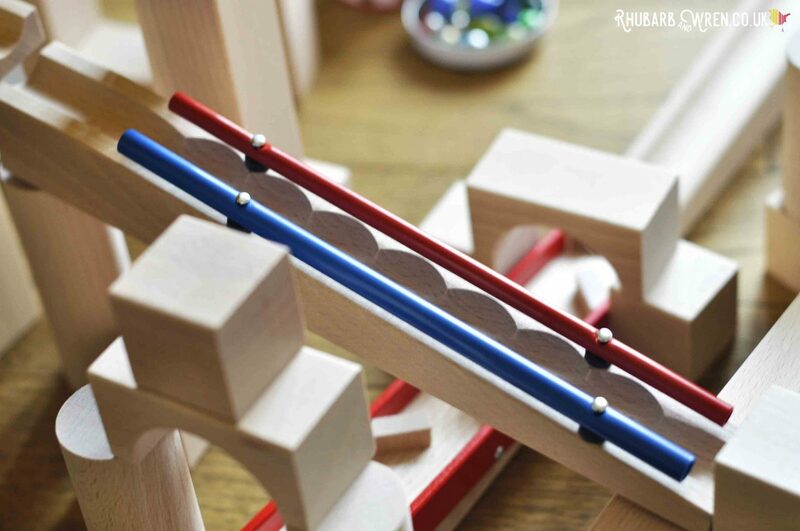 We were very privileged to get the chance to review one of the best – and biggest – marble run sets around when the lovely people at HABA sent us their Master Building wooden marble run set, plus one of the many add-ons that are available. 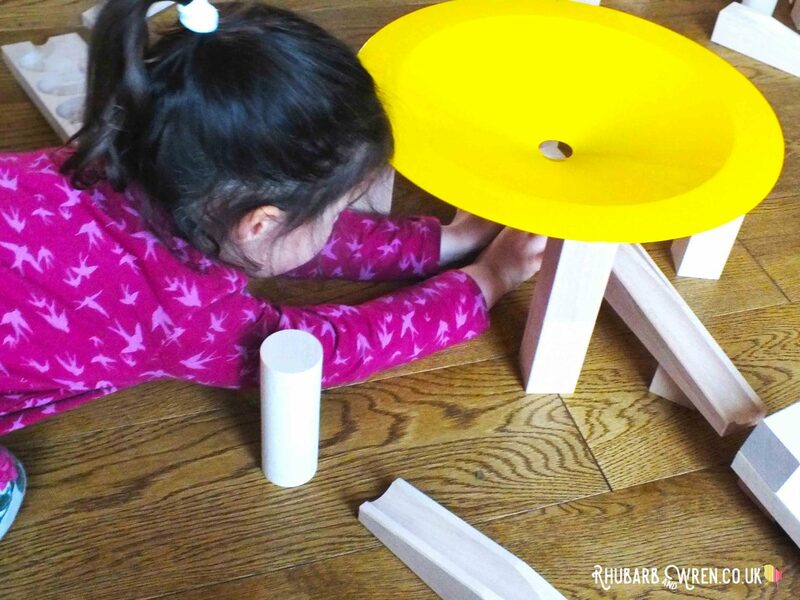 We LOVE marble runs, and over the years have amassed a few different versions, so the kids were more than happy to get stuck in for this review! The HABA Master Building set is a whopper, and arrives carefully packaged in a large (and HEAVY) box. Opening this for the first time was quite a thrill – inside there was box after box of blocks and tracks and a satisfyingly big tin of marbles (containing 36 glass and 2 metal marbles) as well as two large cotton bags for storing the set (possibly my favourite inclusion!). The set also includes a bright yellow, metal, ‘Whirlwind’ funnel that is frankly huge (think bigger than a dinner plate), as well as a variety of ‘special’ track pieces such as the bell bridge and various sound-making track sections. Storage bags included in the set. Even the basic support blocks are beautiful! Blocks can be combined in any way. Unlike most plastic (and some wooden) marble runs available from other brands, the HABA marble run blocks do not clip together – though there is an add-on set of clips that you can use with the set (see list below) if you really want.I must admit that, before we received our Master Builder wooden marble run set, I was concerned that this method of construction would make it harder to build stable structures that aligned well enough for the marbles to get all the way through it. Now that we’ve had a few weeks’ play, I have been completely converted to this way of doing things. An upside-down stool make a great support for the whirlpool. Changing inclines affect marble speed and direction. 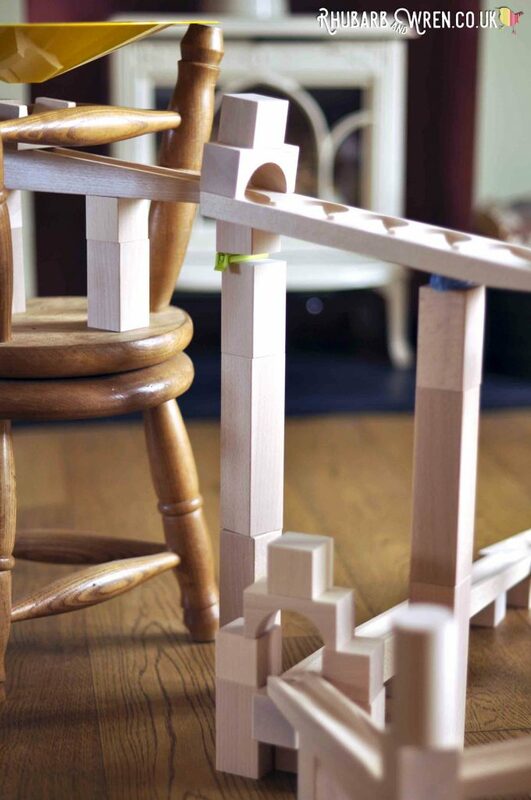 Because the blocks and track don’t lock together, kids can put the HABA marble run together any way that they like – and even integrate other items into the play (you may notice above a couple of little stools that got roped into my kids play to be a support for the Whirlpool!). They have to discover themselves through trial and error what works and what doesn’t – T-Bird didn’t take long to work out that the sloping tracks must all connect high to low, for example. And the repetition of play helps them remember these lessons for next time. The longer they play, the more complicated my kids’ constructions become! 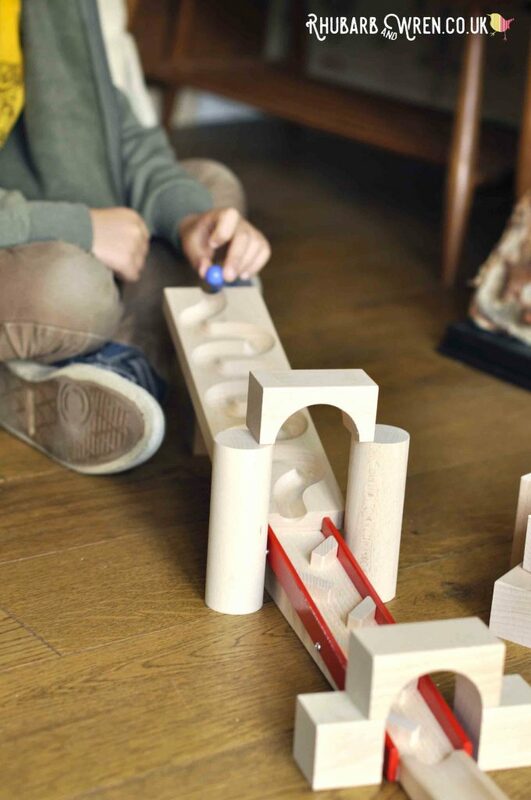 This makes it completely open ended – kids have to use their imaginations to create these marble runs; there are no instructions to tell them what to do. It undoubtably is also more challenging this way, but that, for me, is a positive – I could see the imagination and problem solving that 4-year-old T-Bird and 7-year old G-Man were putting to use in their constructions, as well as perseverance, focus and patience. For instance, after accidentally knocking over some towers, both children started working and moving around more carefully; and when a few alignment issues stopped the marbles from running the full length of the track, the kids had to identify and solve the problem, as well as make sure they were more precise in their placement going forward. 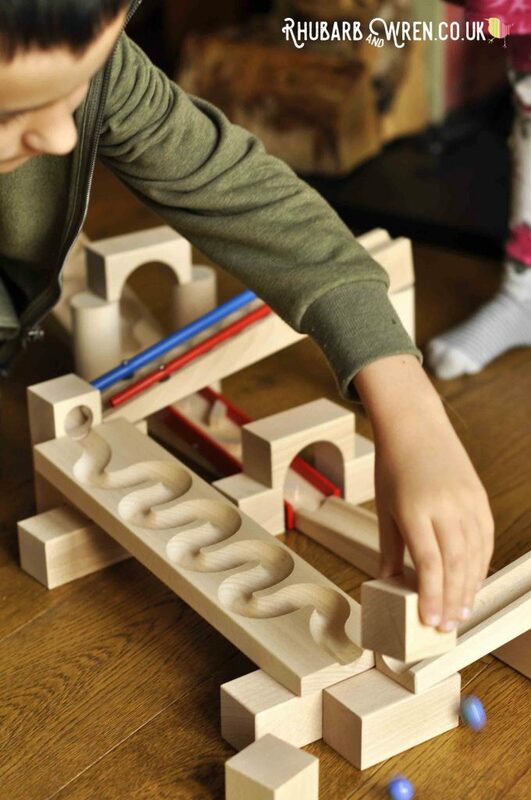 Beautiful, sustainable and local beech wood is used to make this HABA marble run. 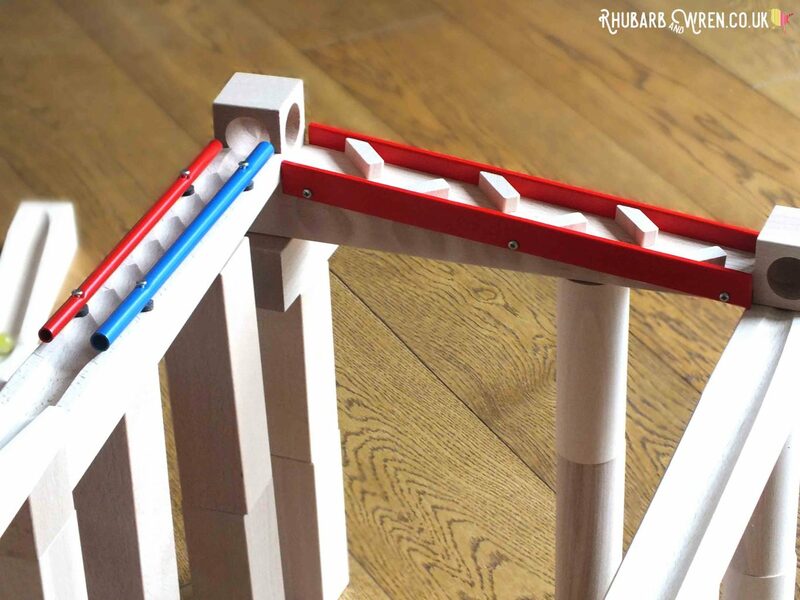 It’s worth bearing in mind if you have younger children, that when we first started playing with the HABA marble run my littlest, T-Bird, was quite content playing with the winding track on its own. It was only after quite a while playing with with this that she went on to annex a few of the special track pieces from the big set to use too. Eventually (partly inspired by her brother’s play) she was ready to get stuck in to the whole set. For the very young, introducing new toys gradually this way really helps to not overwhelm them. Playing with just a few blocks to start with. As we received two cotton storage bags (with cute cartoonish images of the marble run printed on them) as part of the Master Building set, it meant it would be perfectly possible to split the run into two and hold some of the marble run back until younger children have mastered the basic idea with a few of the simpler pieces and a special block or two. The HABA marble run also makes a great toy set to collect gradually over time – buying the different elements as add-ons is much less of an ‘upfront’ investment, and also a fantastic way of ensuring other people have something to buy for birthdays and christmas that won’t flood you with soon-to-be unloved plastic – and there’s plenty of space in those two bags for extra bits! 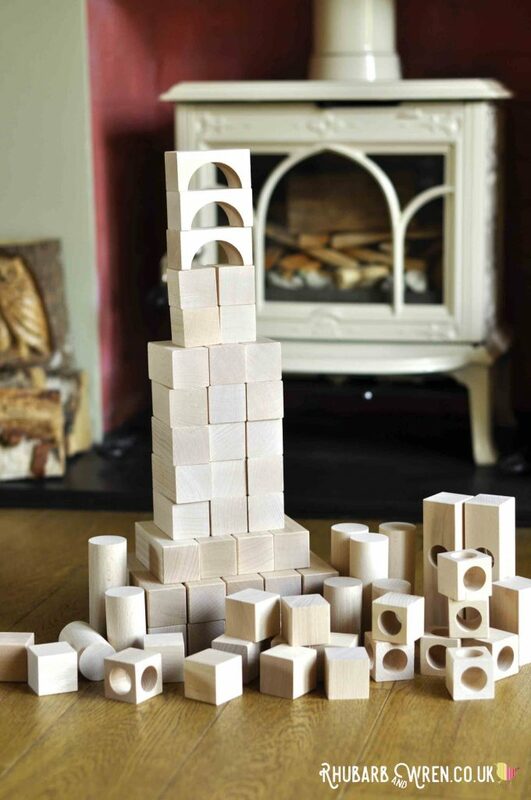 You can use the HABA wooden marble run blocks as straightforward building blocks too. 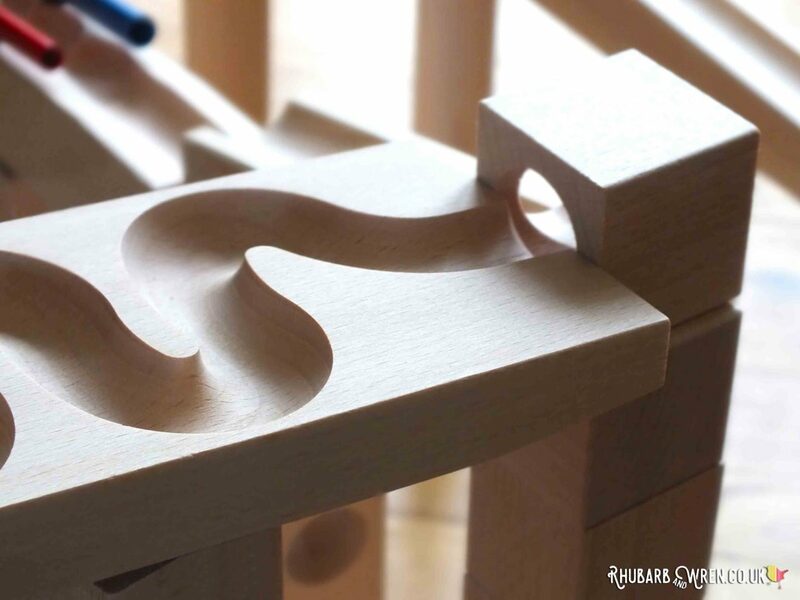 While the basic track, blocks, and corner pieces (those cubes with the holes in that make a turn in the track) are absolutely beautiful and the smooth wood really pleasing to handle, the real stars of the show are those ‘special’ blocks. First up are the three sound making blocks that were a big hit with the kids – the bell, what we like to call the ‘click clack track’, and the hands-down favourite, the ringing track. The bell piece dangles from an archway on an adjustable string. This one did take some time to master – eventually the kids worked out that they got the best results when the bell was dangled from far above the track, rather than directly over it (as in our picture). They worked out that by being on a longer piece of string, the bell was easier for the marble to ‘ring’ as it required less force to move and would swing further when hit – a great example of them discovering and making use of some practical physics. The bell is probably the trickiest piece for very young ones to use because you do have to wind the rope quite precisely to get it working – T-Bird was happy to leave this to me, though G-Man took over pretty quickly. 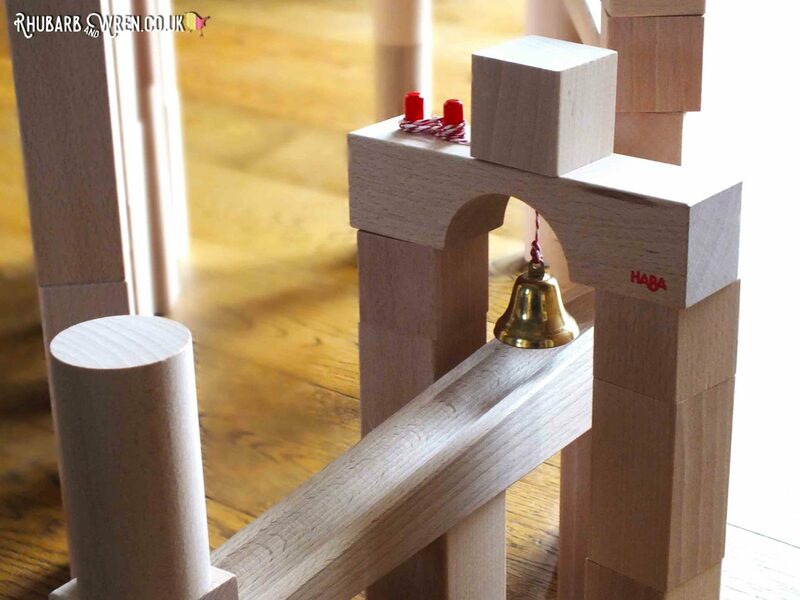 HABA’s wooden marble run ‘bell bridge’. The click clack track (not its official name – it can be bought separately as part of the small Sloped Tracks set listed below) is simple, but very satisfying to use. As the marbles roll down this track, they hit the angled wedges and clatter from side to side with a great ‘click clack’ noise (hence our name!). The ringing track has one red and one blue chime bar that the marbles ping alternately as they make their way down this wavy track. The sound and motion that this track makes is beautiful and everyone – adults and kids alike – loved this piece. The kids were keen to experiment with different kinds of marble to see if it changed the sound, and this was a piece that got used in every single one of their constructions. The popularity of the ringing track has inspired me to put some of HABA’s other sound-making track pieces at the top of the kids’ christmas lists for this year, but in the meantime we’ll have to improvise by adding in some of our own musical toys – a great challenge the kids enjoy with this set. The ‘ringing track’ is our absolute favourite bit of the HABA Master Building wooden marble run set. The Whirlwind (official name!) is a bright yellow metal funnel that the marbles spiral slowly around, before they drop out through the hole at the bottom. It is the coolest bit of marble run kit I’ve ever seen, and my kids are completely in love with it. Mind you, they were preconditioned to like it by those big, round, charity collection boxes that are set up to let you send your pennies spiralling round in much the same way. Once kids figure out how to launch marbles in the Whirlpool, there’s no stopping them! We’ve sent a lot of loot round those things, so my kids knew instantly what to do with this, but there is an art to getting the launch track at just the right angle. Again, I like that this was challenging for the kids though. When my youngest got frustrated trying to get this right, we found that you could roll a marble into the funnel by hand far more easily. Alongside the humungous Master Building set, the marvellous people at HABA were also kind enough to send us one of their add-on pieces – the rather lovely ‘Winding Track’. This pack consists of two large beechwood slabs, raised at one end and with a curving grooved track carved deeply into each, and six pretty blue earth-like marbles to use with them. The tracks are really very beautiful objects – the whisper of the marbles zig-zagging down, along with that to-and-fro motion, is almost hypnotic. The grooves are cut in such a position that they can be joined any way around, though they obviously work separately as well. The HABA winding track in action! We opened this box before we got out the large set, and my kids were both happy to play with these for some time before asking for the rest. This makes a great option for starting a collection for younger kids, providing an easy way into the principles of a marble run for them, and giving us parents a way to get a feel for the quality and functionality of the HABA marble run sets as a whole without investing a large amount of money upfront. Many of the smaller add-on or starter sets would be just as good for this, and there are so many different options that there’s bound to be something to appeal to every child. My son loves the look of the musical elements, while my daughter would love the catapult and trampoline, and personally I would be happy to get them that sloped track set – there really is something for everyone. 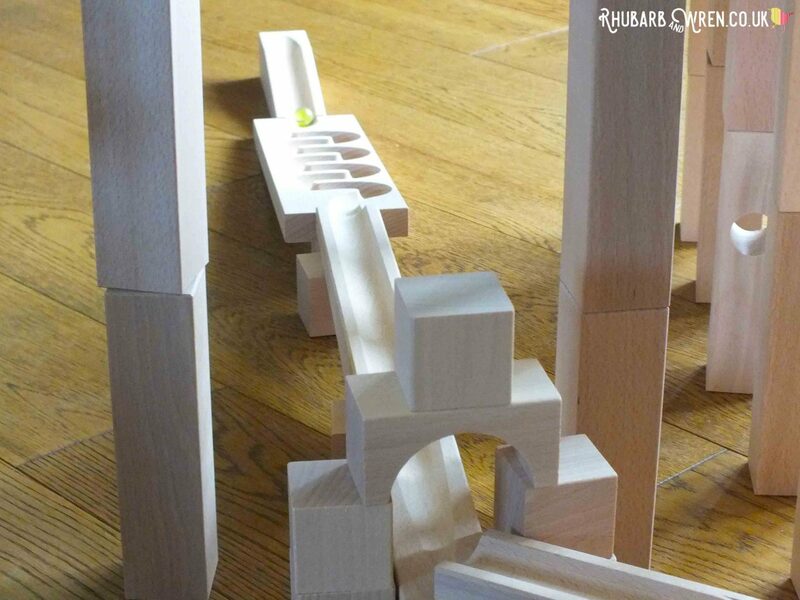 Some build marble runs up, some build them long. And some do both! 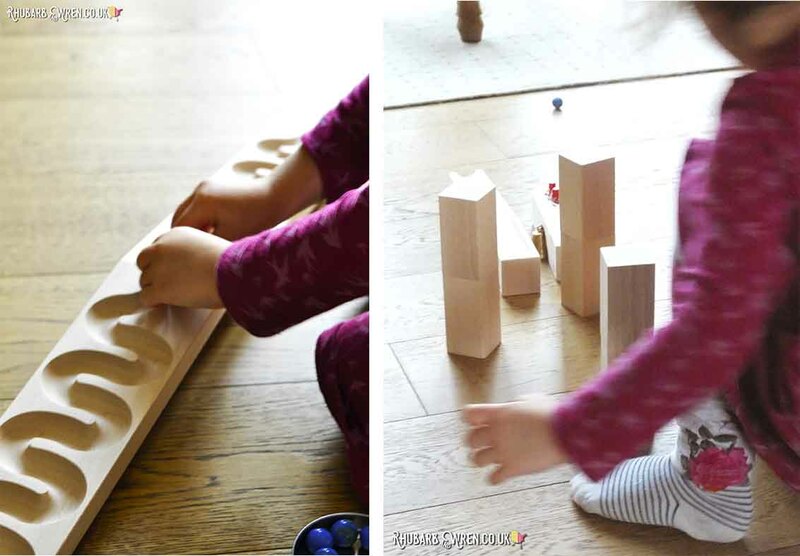 I feel very lucky that we were given the opportunity to review this HABA marble run – it’s so beautifully made and I know my kids will get years of enjoyment out of them. 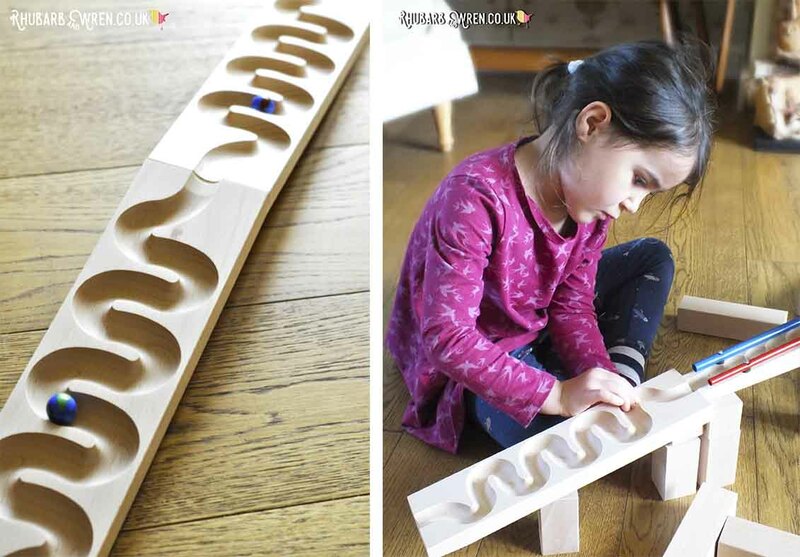 And the simplicity of this beautifully-made marble run belies its value in what it offers for both entertainment and education. This is a toy that can engage and challenge children on many levels. It can be played with by individuals or by groups, and can be as complicated or basic as required, so will grow with them as their abilities develop – and indeed will aid in that development. And, honestly, the HABA marble run is so much fun! Catching the marble as it leaves the whirlpool is as tricky as setting it going in the first place! 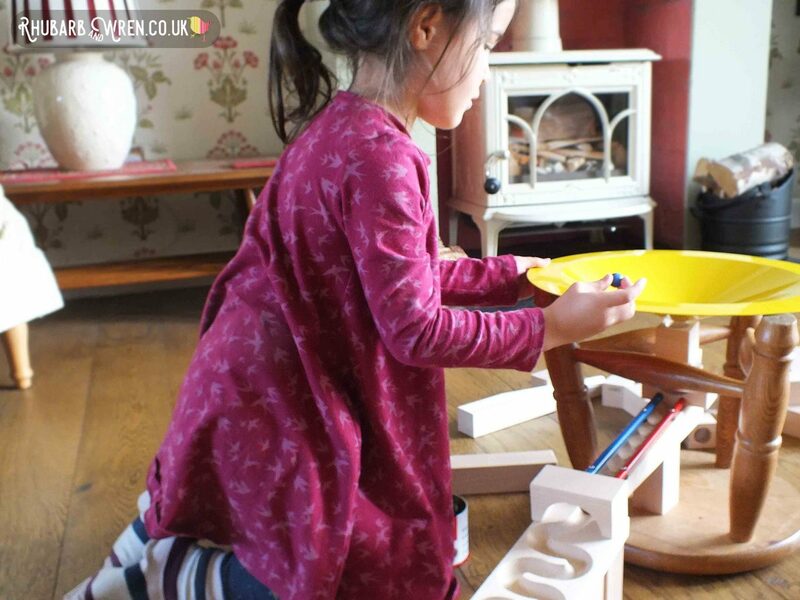 If you would like to find out more about the benefits of marble run play, and what we look for when choosing a set of our own (something we’ve done more than once! 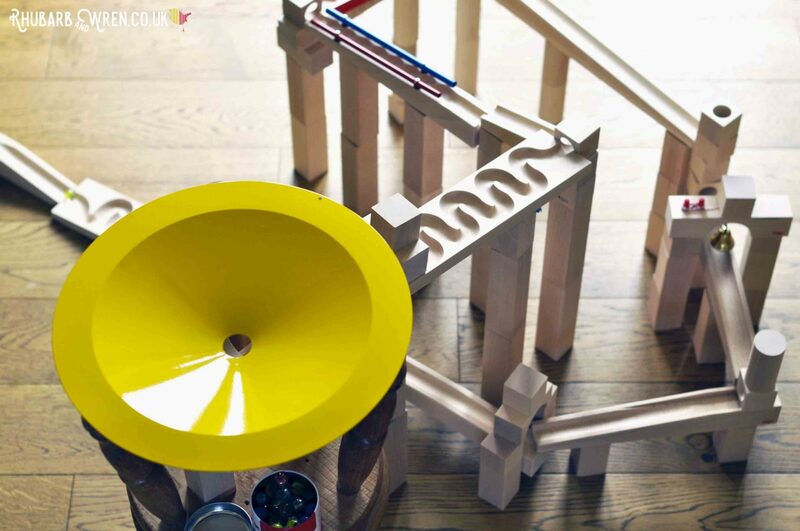 ), take a look at our post on Essential Toys – Marble Runs. 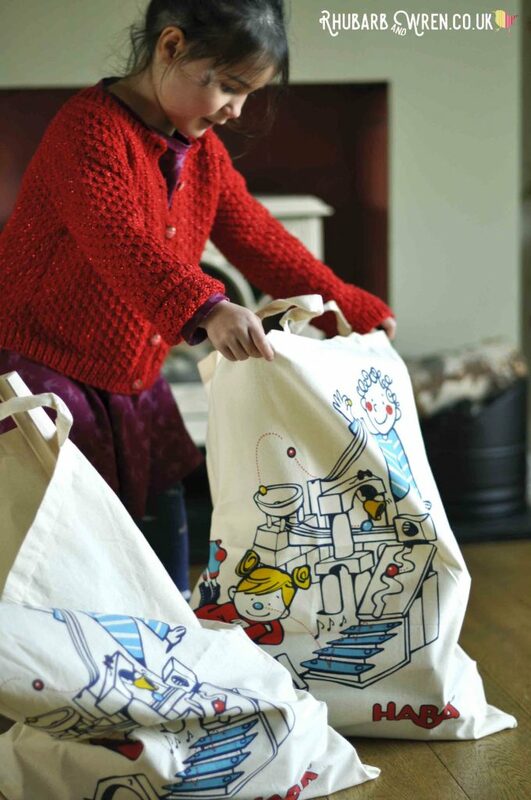 The cotton storage bags that come with the set also make great gift wrapping! HABA were kind enough to send us these toys for an honest review. All opinions in the article are our own, and unless otherwise stated, all pictures were taken of the actual set we received. The HABA marble run sets we recieved for this review were the Master Building Set and the Winding Track add-on. Both are available from Amazon and elsewhere, and many of the ‘special’ sections in our big set are available separately as well. I’ve listed links to Amazon below for reference – these are affiliate links so if you click through and buy, I will receive a small (marble sized!) amount towards the running of this blog, without adding anything to the amount you pay. Thank you so much for your support. Many of the special sections and basic blocks for the HABA marble run are available as Add-On buys – the whirlwind dish and the musical sections of the Master Building Set, for example. There are loads of options available – we love the idea of the trampoline and the catapults, but also the tall structures and the musical sections. Here’s a round up (affiliate links) of some of the HABA marble run add-ons on Amazon. Another of our twenty essential toys are real tools. 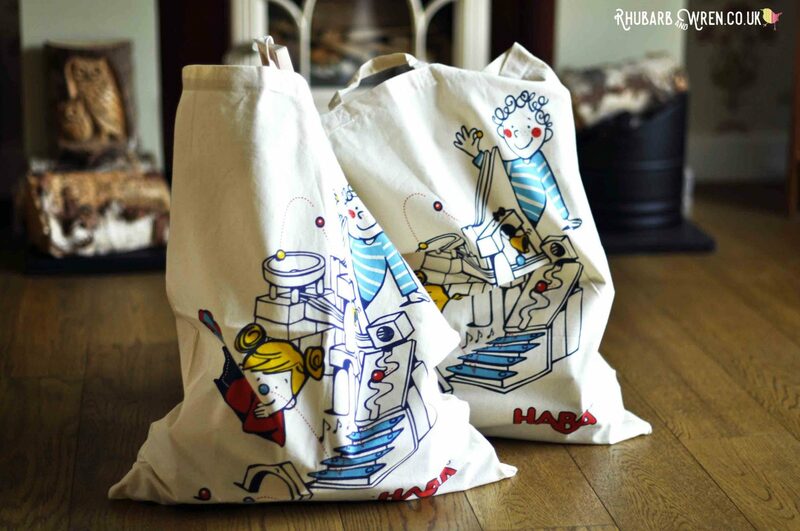 A great option for these are the Terra Kids range, also by HABA, that we tested out recently. Click through to see what we made of them. 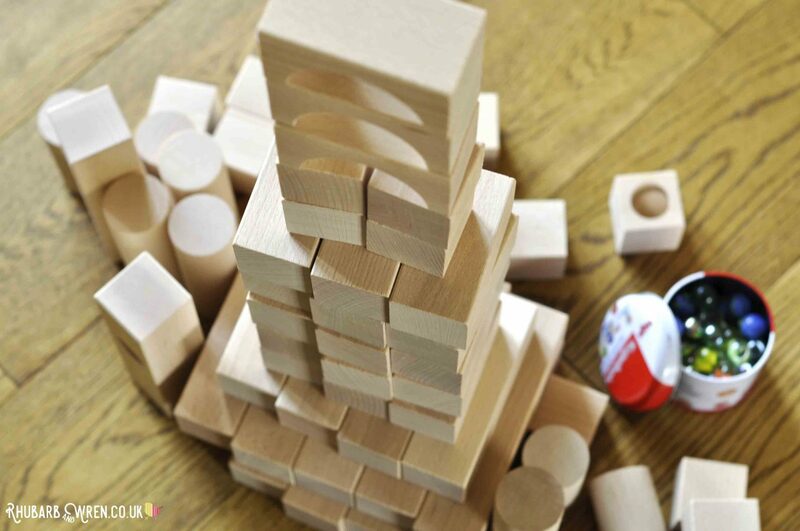 Essential Toys, HABA, Learning Through Play, Marble Run, STEAM, Wooden Toys. Bookmark. Oh wow!! I absolutely love this! My daughter discovered marble runs this week and was engrossed, but she would adore this. I love how open-ended it is and how it really encourages critical thinking and problem solving. Thanks for such a thorough review, now I know what I can get for her birthday soon! Absolutely – and it’s so open-ended that I’m sure the kids will be playing with this for a long time to come!